Have camera will travel: articles and thoughts — What does she know? I travelled there over Easter during what was, according to every single Prague inhabitant I spoke with, the coldest spring they had had in 20 years. It was cold, damp, with biting winds, and mostly grey. To try to make myself feel a bit better about this, I told myself that if I could spend a week in the city and find its beauty in this weather, wandering the streets before dawn until after dark wearing literally every piece of clothing I brought with me (layers took on a whole new meaning), then I could take on anything. I found it in spades. As with any trip of this nature I had done my research before I left. I had pulled up tourism web sites and images of the iconic Charles Bridge and Prague Castle, I had emailed photographers asking for good vantage points and advice, and I had my general list of places and shots that I wanted to capture. In a stroke of brilliance I went to my dating web site and searched for people (men and women because I was not looking for a date) in the city and asked for advice on out-of-the-way places that locals enjoy. They did not end up giving me anything groundbreaking, but I shall be trying this from now on. At the very least, I was told what to avoid as being uber touristy or just bad. Follow the sun: The sun rises in the east, as always, so plan some shots of the castle in the morning from the opposite side of the Vltava to capture the Castle and Mala Strana bathed in morning light. And of course, being on the castle-side at a vantage (after the gardens at the winery near the castle, or better Letna Park) would be a wonderful place to capture the Old Town, Vltava, and bridges at sunset. Lights on, lights off: The castle turns on its lights earlier than the Charles Bridge at night, but turns its lights off earlier in the morning than the Bridge. This means that only the castle is lit when trying to shoot the castle and bridge an hour before sunset, and vice versa for sunrise. It's not terribly convenient, but it's not tragic either. The Bridge: Charles Bridge is crowded during the day, so crowded that you can't really see the bridge. There are vendors and musicians and tourists, tourists, tourists. Be prepared to get up very early, and it will only be you and all the other photographers wandering around with tripods, and runners. Up high: The observation areas from the Old Tower and the Astronomical Clock tower are both good places to start for those bird's eye shots. The Astronomical Clock tower allows tripods, the Old Tower does not (when you see the Old Tower observation area you understand why). Of course, when it is freezing cold and you are the only one up there at 8pm, they leave you alone. They don't make splendor like this anymore: The National Theatre, Municipal House, and the other beautiful performance theatre houses are a must see and all allow photography before the performances and during the intermissions. Not only is Prague a classical music lover's dream, but the tickets are very affordable compared to the rest of Europe and North America. Try not to dress too casual for the opera or you will be stared down by one the older matrons directing patrons to their seats. Biggest disappointment: The Strahov Monastery Library. Do not go hoping to get a different shot than the one in the guide book. It is literally an open door with a rope across and you have to wait to get access to the doorway with everyone else. And you pay extra to take pictures when you pay admission. Biggest disappointment of the trip. Biggest find: There is a beautiful walkway sandwiched in the valley between the castle and the summer house (Letna Park). It is covered with overgrown vines and is beautiful, shady, and peaceful. Most cafe and restaurants have wi-fi even if they don't advertise it. Ask your server for the password. Buy an extra transit ticket at the corner store or metro station and keep it in your pocket for when you want to hop a quick ride between places. Buying them on the tram was a bit confusing for me and the driver wasn't pleasant. If you want to venture off the tourist track, learn some basic words in Czech or you may be met with stony silence. Many of the locals are not crazy about tourists, but will be much friendlier if you can compliment their city and beer in their language. Smoking is still permitted in bars and restaurants. Be prepared to share your airspace with some nicotine lovers if you want a nice seat by the window at Kavarna Slavia. And I don't think I need to say it because everyone has already, but watch your bag. Walking around with a camera is saying, "I don't live here and I have expensive electronics". Bags you can carry in front are a wise choice and keeping your gear light during peak tourist hours is recommended. 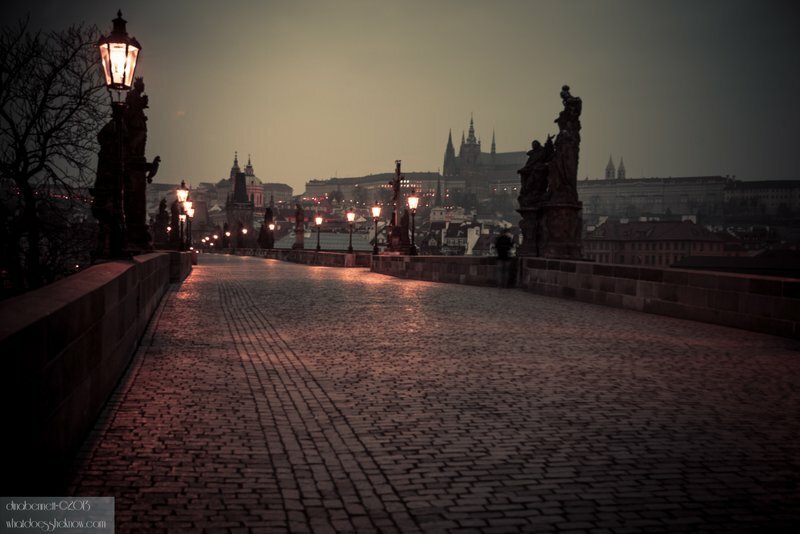 Check out my Prague series in progress here. I'll be posting a more personal vision of Prague later in the week.